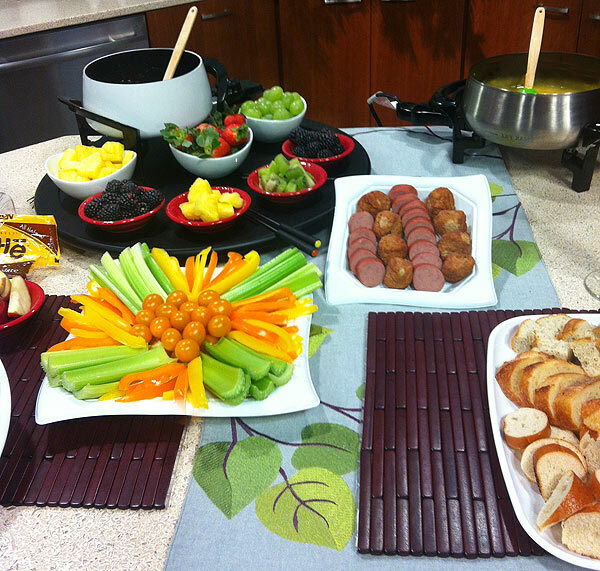 5 Easy Tips For The Perfect Fondue Party! Imagine being able to throw a party without spending all your time cooking! Sound impossible? Not with Fondue! 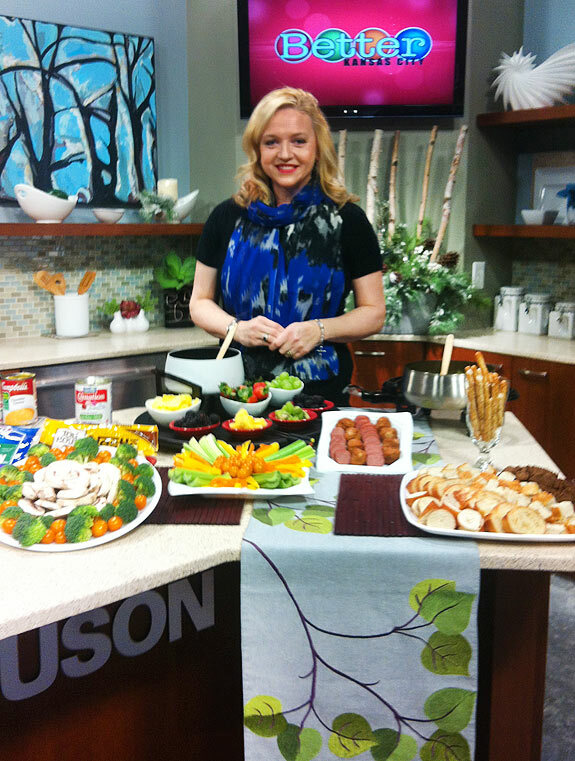 This fabulous way of entertaining has been around for hundreds of years and is a boon for the novice or busy host — Here are five easy tips on helping you to create your very own Fondue party which I shared on Better Kansas City. To see the video, please click here. No doubt, people will ask you where Fondue came from and why it exists. As a gracious host, you should be able to give a quick run down of what is Fondue and how it came to be. The easiest way of explaining it is to say that it has been around for over 400 years and was generally viewed as a peasant dish since it was an easy way of eating stale bread and cheese. Fondue is derived from a french word meaning “to melt” and is traditionally served in a communal pot (caquelon) over a portable stove (chaud), and eaten by dipping long-stemmed forks with bread into the cheese. Although the Swiss are generally known as the originators of this dish, the Italians and French also love Fondue. 1. If you are a woman at the table who drops her bread in the fondue pot, you must kiss the two party guests sitting to each side of you. 2. If you are a man who drops his bread in the fondue pot, you must buy a round of drinks or even a bottle of wine for every guest at the table. 3. 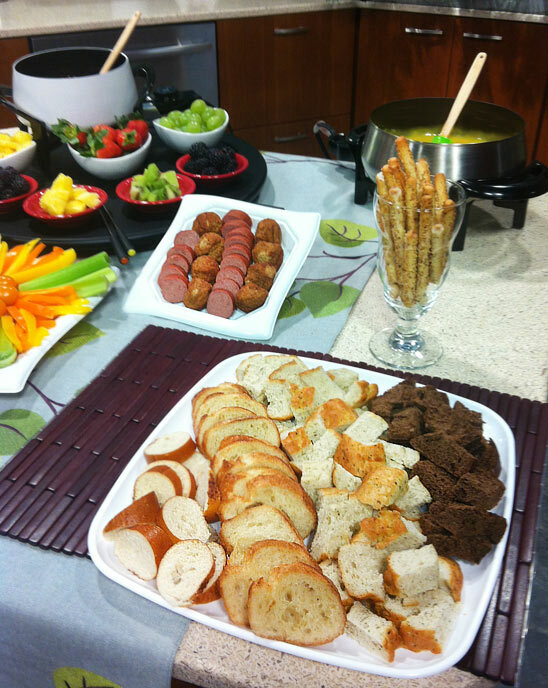 If you drop two pieces of bread (gender not relevant), you must host the next fondue party. 4. Double dipping is never allowed, so make sure you have as much cheese on your dipping fork as you need, the first time around. 5. Dip your food in a figure 8 pattern, it continues to mix the cheese, keeping it creamy for the other guests and gives you the most efficient “dip”! 6. Most important… fondue forks are only to transport your food from the fondue pot to your plate, not to eat off! TIP #3 KEEP IT HEALTHY BY KEEPING IT SIMPLE! If this is your first Fondue party or if it’s been a while since you’ve thrown a fondue party, make sure you use the easiest Fondue recipes and accompaniments. Don’t overwhelm yourself with complicated ingredients which will detract you from focusing on your guests. 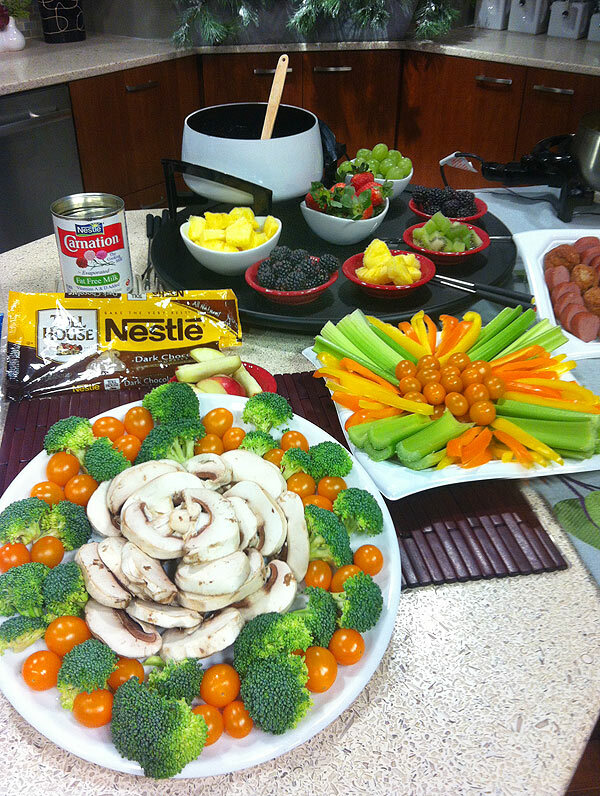 Start off with things and ingredients that you know… like cheese, bread, vegetables, chocolate, and fruit. Simplicity is the origin of Fondue, so you won’t be compromising anything by keeping it simple. Once you get more experienced with all the intricacies, you can expand on what you already know with more complex fondue recipes. Keeping it simple can also help you keep it healthy. If saving calories is important for you and your guests, you may consider altering from a traditional fondue to a more modern and healthy version. Creating an authentic fondue requires a myriad of cheeses, which are not necessarily healthy. Instead, consider creating fondue from two cans of heart healthy cheese soup, 1/2 cup of fat free shredded cheese, and 1/2 cup of regular shredded cheese. You’ll save an enormous amount of calories and sodium while enjoying the delicious fondue on top of vegetables, lean turkey sausage, and turkey meatballs. For dessert, a chocolate fondue comprised of 1 bag of dark chocolate morsels and 1/4 – 1/2 cup of fat free evaporated milk, will take your breath away! TIP #4 ALWAYS PREPARE AHEAD! The beauty of Fondue is that there is nothing to cook! However, don’t let this benefit keep you from doing what all good host and hostesses know… prepare ahead! Do as much of the preparation the day before and just focus on preparing the fondue on the “day of”. This means, cut up your vegetables and arrange your meats. For items which tend to “turn” quickly, such as fruit, prepare those an hour prior to your guests arriving and drizzle with lemon juice to prevent discoloration, then refrigerate. The goal is to have everything prepared so all you have to do is remove the platters from the refrigerator and serving when guests arrive. The good news is that, like fondue, choosing the right drinks are super easy. Traditionally the wine that was used to prepare the fondue, is also served to accompany it… that’s probably the only major rule. White wine is typically the choice, but that has changed over the years to be practically anything. Now, people put beer in their fondue and also drink it to accompany the meal. Brandy or kirsch is a traditional accompaniment since it’s said to help the digestion process. However, don’t feel stifled, practically any drink can be accompanied with the fondue.